Unexpected accidents often seem to happen when the vets are closed and if your dog has a cut, bruise or strain, you should be prepared to treat them. If you have a dog you should keep a fairly comprehensive first aid kit in your house and an additional basic first aid kit in your car if you tend to travel a lot with your dog. Muzzle, dogs may bite when they are in pain (you can also use a bandage or tape). If your dog has skin problems or certain allergies you should also keep medicines that have been recommended by your vet and always check the expiry date. 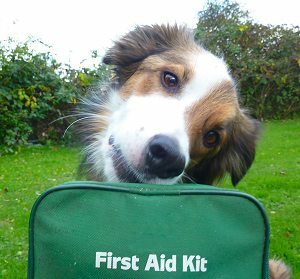 Each dog has different needs so you will be adding other items to your first aid kit depending upon your own dog's requirements.